President Obama's 2014 budget includes tax proposals that would raise more than $800 billion over a decade. Those taking the biggest hit by far would be the very highest income households, but others down the income scale would have to pony up a little too. In effect, the president's budget would violate his pledge not to raise taxes on those making less than $200,000. "The president stepped over his no-taxes line-in-the-sand for those making less [than $200,000], but not by much more than the length of his big toe," wrote TaxVox blog editor Howard Gleckman. Roughly 60% of the $800 billion in new tax revenue would come from those making more than $1 million, according to a new analysis from the Tax Policy Center. Less than 15% would come from households making below $200,000. And the actual increases for taxpayers in that band would be relatively minor. That they would see any tax increase is due to a few of Obama's tax proposals that would affect people at all income levels -- such as an increased cigarette tax and a change in the way inflation is calculated. But the lion's share of Obama's proposals specifically target the highest income households. Among them, capping the value of tax breaks for those making more than $200,000, and imposing a new minimum tax on those making more than $1 million under a so-called Buffett Rule. The Tax Policy Center estimates that in 2015 someone making between $40,000 and $50,000 would pay an average of $23 more in federal taxes and only 16% of households in that income group would actually see a higher tax bill. By 2023, that income group's average tax increase would rise to $77, and a full three-quarters of households in the group would be hit. That pales in comparison, however, to the richest filers' increased tax bite. In both 2015 and 2023, more than 98% of households making more than $200,000 would see higher tax bills. For those making between $500,000 and $1 million, their average increase would be $7,630 in 2015 and $11,504 by 2023. And for those making more than $1 million? 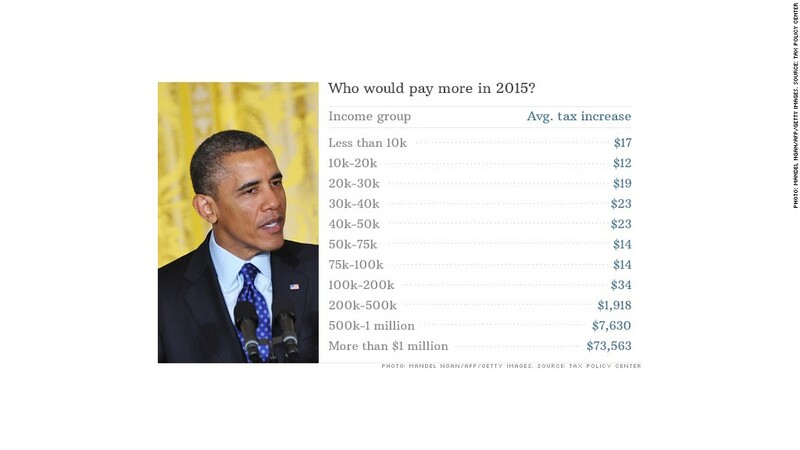 Their average tax increase would come to nearly $74,000 in 2015, and $85,000 in 2023.